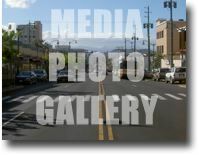 Healthy food and quality service in Kaimuki. Local first, organic whenever possible, and with "Aloha always" is the mantra upon which this unpretentious neighborhood bistro was founded. Local & Pacific Asian Comfort Food Dining for Friends and Family! Serving a delicate blend of European, Pacific Rim and Island-Style Cuisine. For about a month each year, we are able to enjoy this fresh, delicious salmon flown directly from Alaska. For all the salmon lovers, it is a MUST to join us during this time. Making Hawaii's Best Malasadas, Homemade Ice Cream and Baked Goods from scratch. Serving Custom Hawaiian Coffee from Maui and Ka'u, paired specifically for our creamy desserts. A small price to pay for heaven... serving up its freshly baked specialty cheesecakes and coffee. Otto cake is a local business serving the best Cheese Cakes in the Honolulu Area. Serving Kaimuki since 1987, Gecko Books & Comics offers a vast selection of Comics and comic related merchandise, including toys, games, trading cards, and supplies. Comic-related action figures, Japanese and American toys, comics, Asian DVDs and much more. 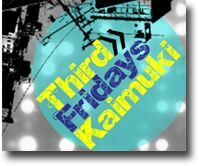 Estate Liquidators Hawaii will be serving wine Friday evening from 5pm - 7pm for Third Friday. Please join us and help support the Ronald McDonald House of Hawaii with a purchase of pottery. Bikram Yoga is a unique sequence of movements performed in a hot room that can help reverse the aging process, improve your overall physical and mental health, and increase flexibility and balance. Art, food, music and fun. 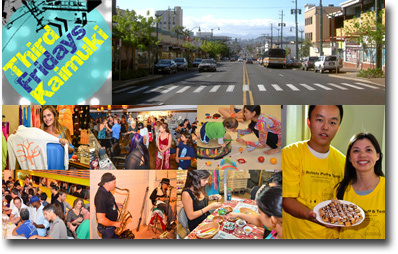 Third Fridays Kaimuki is a monthly event where Kaimuki merchants and businesses come together to celebrate all the great things that the community has to offer!